The .45 ACP (Automatic Colt Pistol), or 45 Auto (11.43×23mm) is a handgun cartridge designed by John Browning in 1905, for use in his prototype Colt semi-automatic pistol. After successful military trials, it was adopted as the standard chambering for Colt’s M1911 pistol, being named .45 ACP. The 45 Auto is effectively used in various carbine rifles like the Kriss Vector. 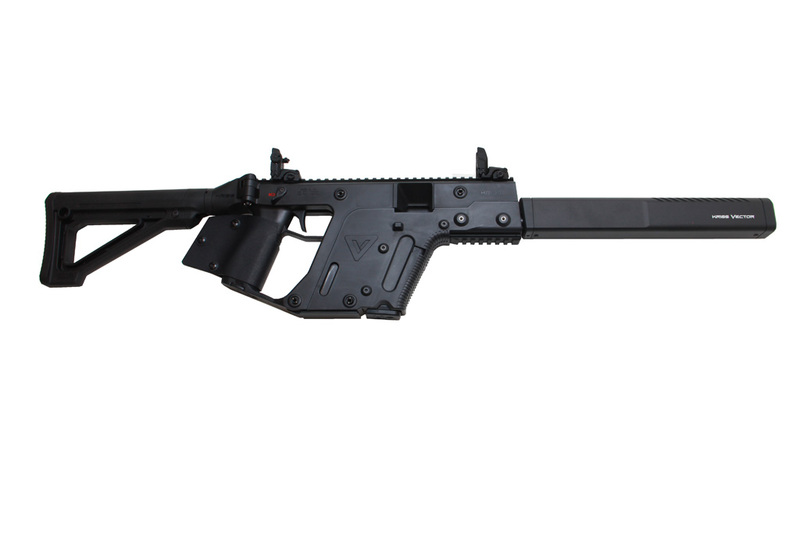 California Legal KRISS VECTOR CRB GEN 2 45ACP BLACK RIFLE. available at Cordelia Gun Exchange. The 45 Auto is an effective combat pistol cartridge that combines accuracy and stopping power for use against human targets. It has relatively low muzzle blast and flash, and it produces moderate recoil in handguns, made worse in compact models. The standard issue military 45 Auto round has a 230-grain bullet that travels at approximately 830 feet per second when fired from the government issue M1911A1 pistol and approximately 950 feet per second from the M1A1 Thompson submachine gun. The cartridge also comes in various specialty rounds of varying weights and performance levels. In its non-expanding full metal jacket (FMJ) version, the 45 Auto cartridge has a reputation for effectiveness against human targets because its heavy mass has the capacity to penetrate tissue deeply and damage the central nervous system, and its large 11.5mm diameter creates a more substantial permanent wound channel than other calibers, which can lower blood pressure rapidly if critical organs of the circulatory system are hit. Drawbacks for military use include the cartridge’s large size, weight, increased material costs in comparison to the smaller, flatter shooting NATO standard 9×19mm Parabellum cartridge, which uses less powder, brass, and lead per round. Standard 9mm NATO ammunition has limited armor penetration capability − a deficiency with .45 ACP whose large, slow bullet does not penetrate armor to any great extent. The low muzzle velocity also makes the bullet drop over long ranges, making hits more difficult; however, it is important to note that the vast majority of self-defense situations involving handguns typically occur at close ranges.